The city of Ishinomaki in Japan was one of the hardest hit when the massive tsunami waves hit the coastline and traveled inland on March 11, 2011. These are images from NASA’s Terra satellite. 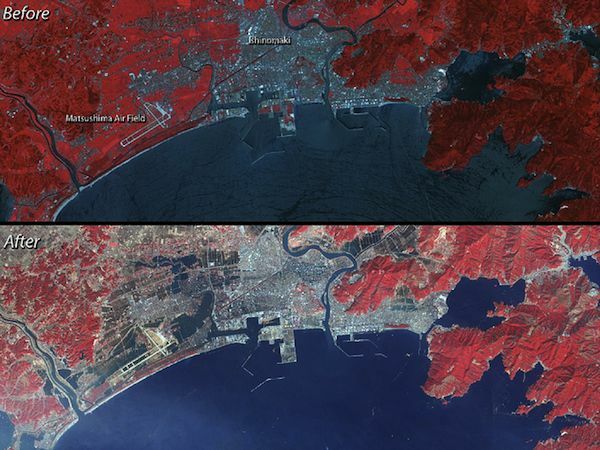 In the top image of the two below, we can see that three days after the event, on March 14, the city is still inundated with flood water. The bottom image shows water under normal conditions. Water is shown in dark-blue in this false-color image. Plant covered landscape is shown in red, exposed earth in a tan color, and the city in a silver color. 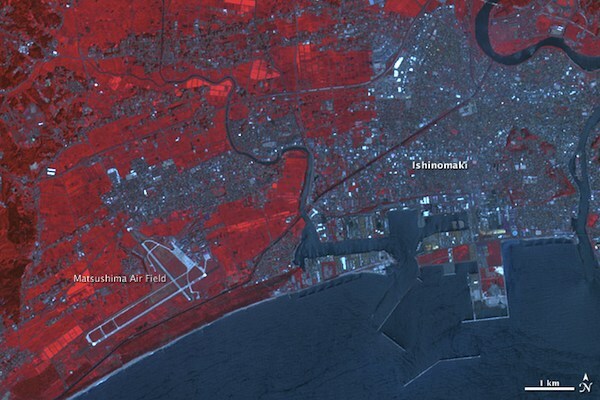 Water is most obvious in flat, open areas were fields were, and the most extensive flooding is apparent around the Matsushima Air Base and nearby suburbs. These are in the lower left of the images. 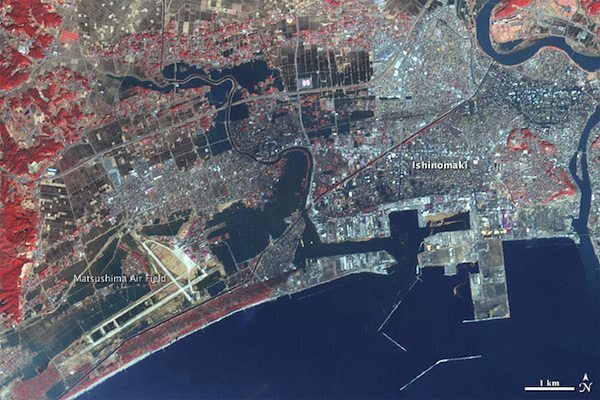 In the After image, water fills the area between buildings in areas of Ishinomaki near the harbor, in the middle of the images, and by the river at the upper right. Survivors were being rescued by boat in these areas. Images by NASA Earth Observatory, using data provided courtesy of NASA/GSFC/METI/ERSDAC/JAROS, and U.S./Japan ASTER Science Team.